Why I am making it my mission to attend the ONS congress this year! Since the beginning of 2019, I have made it my mission to help Oncology Nurses stand out in social media. On my Instagram, I try and follow a lot of you back and actually interact with what stage of the game you are in. I am surprised by how many of you want to pursue emergency departments or critical care. And I get it! I was right there with you during nursing school. They both have a certain cool and bad a** feature about them. Plus, after either of those fields, you can literally do almost anything! But what you are missing out on is how cool and bad a** oncology nurses really are! I am literally administering medications to patients that disrupt their cell's DNA! Not only that, but a lot of these drugs may be from a clinical trial and the research on these bad boys is limited. Sometimes you are not even sure if the medication is more harmful to the patient than helpful. There is a certain rush that comes with administering hazardous drugs. You are probably thinking, but Megan, in critical care or the ED, I can bring back someone's life. Well so can I as an oncology nurse. Sometimes this happens with the cycles of medications I am giving and sometimes after someone has had a drug reaction. Hypersensitivity reactions that occur from chemotherapy are no joke! If you want a rush, then wait till you experience one! Another good reason you should think about oncology nursing is that you actually get to follow up with your patients! No more wondering if they actually made it! From diagnosis on to treatment and on to survivorship, oncology patients will need healthcare and therefore you will get to know them and their families. It is the most rewarding part of my job. My passion for oncology has only continued to grow since starting on a Medical Oncology floor. At first, I joined the oncology nurses society and only briefly paid attention to their monthly newsletters. Then after a year of working, I obtain my biotherapy and chemotherapy providers card which you can read about here. I think this was the real switch for me. A few months into giving chemotherapy, I noticed through someone on Instagram that there was a huge Congress for oncology nurses. It sounded so amazing to attend 4 days of straight wisdom from the superheroes of oncology nursing. Unfortunately, it was a little too late to sign up, find travel, and attend. Thus I set my sights on 2019. Why should you attend a nursing conference? One// Endless amounts of networking opportunities! Whether you are in the need of a new job or just looking for inspiration, a nursing conference will expand your mind of what you think nursing is. Plus, it will leave you rejuvenated and reenergized. Two// They are fun! In nursing school, I went to a sigma theta tau research conference and I had a blast. Even though I did not know anyone and I was not in my career yet, but it was great! I had the opportunity to meet and discuss with highly intellectual women in my respective field. I also met with exhibitors who had really great products and resources. Three// You aren't at work with the hustle and bustle! How many times have you jotted something down to look up later after work? Well now is the time to really dive deep into your education and learn about the evidence-based practice you can bring back to your own job. Four// You can create your own schedule! There are a variety of options for speakers, exhibitors, and poster sessions at a conference. You can really pick and choose what you want to see/hear. Five// SWAG. Lots and lots of goodies are handed out at nursing conference! Plus, you can enter raffles for some pretty cool items. Six// Travel! Nursing conferences are often held in a different state from you. So it's a great way to travel and explore while obtaining CEUs. So here we are... T minus 58 days till Congress and I actually have not bought my ticket yet! Wondering why? Well, it is mainly because I was trying to get my finances back in order. And here’s my real life (I am not looking for any sympathy or pity): I work 72 hours a week with pretty decent pay and benefits, but I have student loan debt, 2 car payments, and take care of my mother full time. I’m not sure I have ever mentioned it anywhere, but my mom stopped working entirely right after I graduated from Nursing school and started as an RN. We have battled TOS, chronic migraines, Barrett’s esophagus, fibromyalgia, and now potentially lupus and celiac diseases. Physically and mentally my mother is just not well enough to work let alone do the majority of her daily activities of care. It has been challenging but I am thankful that I am able to provide. 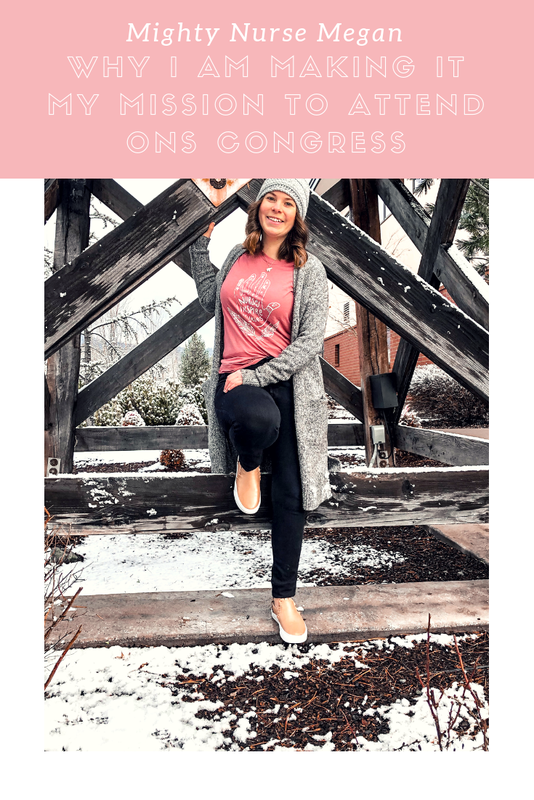 With that all being said, I have been searching long and hard for creative ways to partner with some of my favorite brands to make it to the ONS Congress. Since I just recently switched to a new job, I am not eligible for any educational reimbursement until after a year of employment. ONE// Book at a hotel with one of my besties to help split the cost! TWO// Fly at unreasonable hours because it is cheaper! And do not be afraid to have a layover. THREE// Save every penny from now until then. My plan? (1) Cook/prepare all my meals at home to help avoid spending money while eating out. (2) No online shopping. Lucky for me there are no holidays coming up. (3) No hot cocoas, smoothies, or drinks bought at coffee carts/shops. FOUR// Apply for scholarships! That's right, scholarships are not only for tuition at schools. But there are scholarships usually available from nursing organizations to help offset educational costs. So there you have it, friends! I cannot wait to share everything from the conference. And if you are going to be there, please say hi! I am also looking to host a meetup.